In our longstanding career as Toronto master plumbers, there is one fact that stands: Without proper care and maintenance, all pipes will become clogged at some point in time and when that happens, high-pressure water jetting is a viable and effective solutions. Since drains are responsible for removing waste from our homes, they are prone to becoming clogged up with sludge, sediment, soap scum, hair and grease. Environmental factors also contribute blocked drains. Trees planted near the home tend to cause many problems in Toronto drains, as the roots infiltrate the pipes, over time causing them to become blocked up. When tree roots prevent normal flow, cutting the roots using a special cutting device attached to a sewer camera, followed by high pressure water jetting is the perfect solution. Anta Plumbing will apply normal water, pressurized to 60, 000 psi and blast it through the blocked pipes using special nozzles for different applications. It is used to wash plumbing and drain systems on the inside. Some of the nozzles are made specifically for the purpose of removing sludge, dirt or debris from your plumbing system. Specialised equipment used along with high-pressure water jetting machines include robotic chain cutters that can remove root infiltration, concrete, rust and other cumbersome objects from your pipelines. Industrial water jetting equipment is used to remove tough product from the inside of production pipes and for surface cleaning. It is a matter of combining the right strength hydro jetting machine with the correct nozzles. For plumbing purposes, we use special sewer nozzle technologies in conjunction with the hydro jetting machines. ●	does not put further strain on fragile or overworked pipes. ●	can power-clean pretty much any type of clog. ●	improves the flow of the entire residential plumbing system. 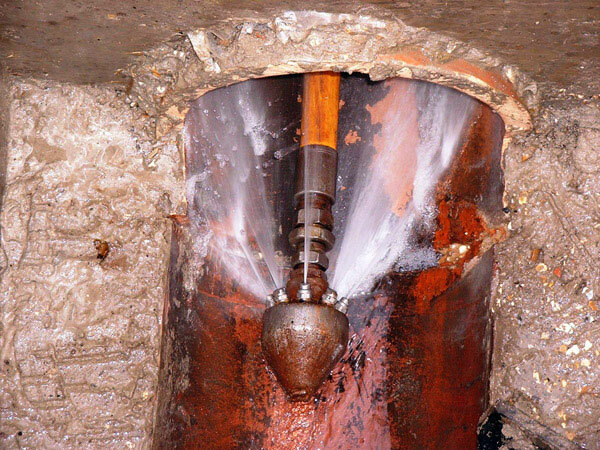 ●	flushes loose debris through the plumbing system into the municipal sewer. ●	leaves the pipe interiors clean. ●	is the safest, most effective way to completely remove fats, oil and grease (FOGs) from pipelines. ●	is an eco-friendly, efficient and economical drain cleaning solution. Here at Anta Plumbing, we employ some of the best-trained technicians and Toronto plumbers. They understand the factors that are involved in the process, and they will select the correct nozzles and and flow rate for your particular needs. They are trained to identify and handle different types of debris that might be present in the pipes and they can identify the different pipe types that affect the pressure levels required to clear your pipes. Anta Plumbing is standing by to provide you with premium hydro jetting drain services for your specific needs.